I am a man blessed with two home countries, one is my native geologically stable Sweden and the other is my new home country of Guatemala. The latter is being highly geologically active to the point that it is to be considered as a geological high risk zone. We all know that this is a country of intense volcanism with no less than 3 volcanoes that are currently erupting. These are Fuego, Pacaya and the Santiguito cone of Santa Maria. There are also the VEI-7 caldera of Amatitlán and the VEI-8 caldera of Atitlán caldera that famously put out the 2 800 cubic kilometers María Técun Tuff that inundated Central America, Mexico and southern USA. I will get back to the volcanism in later articles that I have planned. Then you have the large (above M7) earthquakes caused by subduction that ravages that country roughly every 37 years. In the time span between 1717 and 2012 there were 8 of these large tectonic earthquakes. They constitute of either a main shock followed by a quickly abating swarm of aftershocks, or by a brief spatter of foreshocks followed by a main shock within days and a swarm of aftershocks. These types of earthquakes are caused by subduction as pacific crust is being pushed down under the Caribbean plate and they have repeatedly ravaged the country causing numerous casualties. There is though a second type of geologic activity causing widespread destruction and death tolls. These are prolonged tectonic earthquake swarms in or around volcanic centers. Generally the magnitudes are lower compared to the normal tectonic regime, but the prolonged shaking is highly detrimental to both the steadfastness of buildings and to the human psyche. One of the more famous swarms occurred in the Quetzaltenango district in 1902 and constituted of a 3 months long swarm prior to an M7.5 main shock on April 18 at 8.23 pm. This was followed by a two week long swarm of aftershocks and sustained earthquake swarms. The initial swarm is believed to have been caused by magma rapidly intruding under the Santa Maria volcano that in turn caused the magma reservoir to expand. This in turn caused rapid strain build up on an adjacent fault and caused it to rupture at 25 kilometers depth. On October 24 Santa Maria erupted in a VEI-6 eruption that devastated the flank of the volcano. Before we start with the seismic crisis we need to take a look at the volcanic and tectonic settings in the area. First of all we have one large and one small caldera in the area. The larger of them consists of an active spread center that is surrounding Guatemala City creating a lowland of sorts wherein you find most of the city. This spread center is inundated of fractures and with major fault lines on two of the sides going out perpendicular from the edges of the caldera. Through the caldera you have two other faultlines going out at 90 degrees from the spread center faultlines. Think of these two as versions of the San Andreas Fault in California and you will understand how they operate. Inside the caldera you have a large accumulation of magma at depth and shallower magma reservoirs filled primarily with rhyolite that is prone to either extrude as massive rhyolitic domes, or erupt explosively in VEI-6 to VEI-7 eruptions. The dome extrusions are more common than the explosive eruptions. And from this geologic mess you have a massive volcanic line extending from the edge of the caldera via Pacaya and Agua all the way to Fuego and Acatenango. However you count it is not the best spot on earth to place a capital city. The Guatemalans have had to abandon two capital cities prior to the current Guatemala City. After the destruction of the second (todays Antigua) they decided to move the city to its current location based on the knowledge of the plain being surrounded by faultlines and fractures. The idea was that it would make the part in between safe from large earthquakes. It was decidedly not the best of ideas and has led to intermittent destruction of the capital. It is the only capital on the planet where you can be certain that your house will come down in an earthquake and that you will be certain to shovel volcanic ash every now and then. It has created a rather unique architectural style since very few people ever bother with finishing a building or ornating it. After all, why bother when it is going to come down in a while? Or, why repaint the house when you can paint your new house in a decade or so. Or as my wife pointed out to me when we where newly married: “Are you not going to put on night clothes?”; and I answered something along the line that it was warm and I needed no clothes. To this she calmly answered; “You will look stupid standing naked on the street after the earthquake”. You get the picture. On November 1917 an intense swarm started inside the Amatitlán Caldera under the village of Amatitlán. The cause was an intrusion from depth of fresh magma that remobilized one or possibly two reservoirs of rhyolite. Judging from areas of uplift and long term geothermal changes the event can be classified as a failed dome extrusion that is still causing periods of rapid inflation and deflation to this day. The event also increased the temperatures of the famous geothermal wells that feed the geothermal baths in the village. About the geothermal baths, they are probably wonderful if you like over-crowded tourist spots. I am not one of those people, and if you are like me all you need to do is to meander down to the waterfront and you will find nice bars with cheap bear (3 US dollars for 2 liters of tasty Gallo) and a stunning seaside view, or boats that you can ride across the lake in splendid isolation. Over the next couple of weeks another swarm started at the caldera wall towards Guatemala City under today’s Villa Santorini community. This is the spot where things took a turn for the worse since this started an episode of spreading of the spread center (Graben) upon which you find Guatemala City. This second swarm really never stopped, I can still detect daily earthquakes here. A bit disconcerting since my wife has her house on top of the commotion at Villa Santorini. It is still unclear if there is a rhyolitic magma reservoir there or not, but however you look at it our house is not situated at the best spot. Regardless if there was an intrusion there or not, this swarm weakened the two radial San Andreas like faults until both of them started to sequentially break. This in turn caused the two main line faults on the edges of the Graben spread center to start breaking apart. And during the next few months Guatemala City was hammered by earthquakes every day. The activation of no less than 4 major fault lines at the same time meant that the houses were shaken in different directions every time. So, even if no earthquake was larger than M6 it meant that sooner or later the direction of shaking would be along the weakest point of any house. In the end this meant that almost the entire city was laid into rubble and that the population had to sleep outdoors in the streets and in the parks. One more unexpected outcome of the seismic crisis was that the city central cemetery was destroyed with 8 000 corpses being pushed out of the ground. To avoid spreading of deceases all of these corpses were burnt together in a large funeral bonfire. The cemetery was never restored and is abandoned to this day. Officially the seismic crisis ended in January 24 1918, but that is not true. There were intermittent earthquake swarms continuing at least until the 1927 eruption of Acatenango. These swarms all took place inside the caldera along a path following the volcanic Pacaya – Fuego line as magma moved out towards those volcanoes. The period prior to the seismic crisis is a statistical anomaly in the region. Normally at least one of the three recalcitrant volcanoes of Acatenango, Fuego and Pacaya are erupting. Any remission between activities is short to say the least. A year without an eruption is rare, several years of rest is pretty much unheard of. In 1896 Fuego stopped erupting starting a hiatus lasting until 21 January 1932. 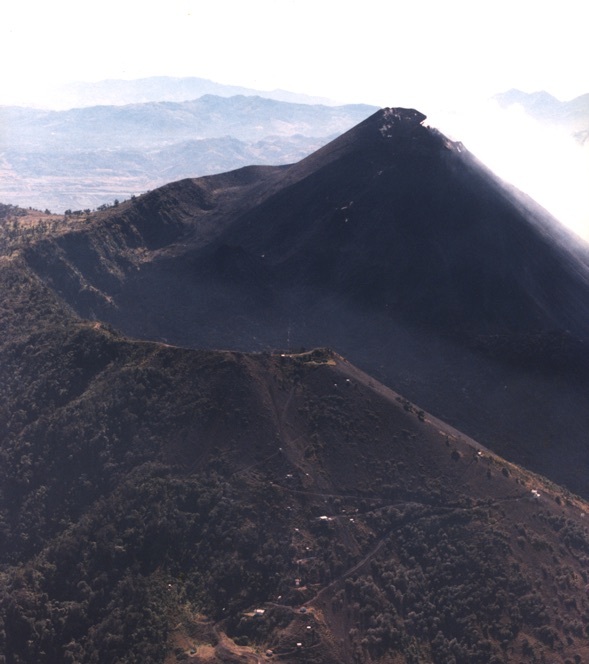 Pacaya stopped erupting in 1885 and was in remission until 11 March 1961. This left the volcanic system without pressure relief for 36 years and that is a probable cause for the prolonged seismic unrest. Acatenango was until the 1924 eruption believed to be dormant or exinct with no known eruptions in historic times. Later research have though shown that it had been active last around 1450. It is likely that fresh magma moved in under the systems during this period, something that seems to be evidenced by the high rate of activity that all three volcanoes have been in since they restarted their eruptive cycles. Especially intriguing is the fact that the seismic crisis ended with the re-activation of the dormant Acatenango volcano that coincides with the cessation of the seismic crisis a full decade after the onset of seismic activity. The social effect was tremendous as almost everyone in Guatemala City became homeless during the height of the seismic crisis. This caused social unrest in Guatemala City that ultimately led to the removal of the long term president in 1920. During the aftermath of the seismic crisis the Swedish Prince Wilhelm toured the country surveying the destruction (What is it with Swedes and Guatemala?). In terse notes he wrote about the rampant corruption among the President and his ministers. According to his report all economic relief money funneled to Guatemala ended up in the coffers of the President and food and construction material was purloined by his ministers and sent to neighbouring countries were they sold it for a tidy profit. According to Prince Wilhelm not a single dollar ended up in the hands of the population. In the end Guatemala City was rebuilt, but you can still to this day see ruins from the seismic crisis along with numerous other ruins from large tectonic earthquakes like the 1902 and the 1976 earthquake. Oh, and do not miss the Mayan city underneath Guatemala City that is completely covered in volcanic ash complete with underground pyramids (Guatemala is filled with serious Indiana Jones moments). And as you walk in Guatemala City you are constantly looking at buildings thinking about how they will look as ruins after the next large earthquake. It is a sobering thought indeed. It is easy to think that people should not live in a place that is so dangerous. But at the same time Guatemala is a land very rich in arable soil and grows the best coffee, spices, nuts and abundant amounts of sugar, not forgetting that it is the home of chocolate. All of this is possible due to the tectonic setting and the rampant volcanism creating the most varied and fertile soil on the planet. Another thing to remember, the climate is the best on the planet. And it is a place of tremendous beauty. Even though it is filled with corruption, ugly unfinished houses, litter and crime it is at the same time heartbreaking in its beauty and utterly easy to fall in love with. Because paradise is never a true paradise if it is not fraught with the dangers that creates the possibility for a paradise lost. Let me take a personal example, my wife has a wonderful little house between the rainforest and the Pacific Ocean. Behind the house you have green trees, flowers and a small river, at the front you have a perfect volcanic beach filled with picture perfect palm trees and sunsets over the Pacific. At any time there may be a megathrust earthquake out in the ocean and in comes a tsunami and sweeps you and the house away as you sit with a beer in hand. And if that doesn’t happen the rising ocean levels caused by global warming and the eroding beach will sooner or later sweep away your little house in paradise. But, while it lasts it is as close to perfection as you can come. And the same goes for all of Guatemala. Great article – looking forward to more on Guatemala. In a lot of ways, Amatitlan is sort of the Campi Flegrei of the western hemisphere. -Both are enormous calderas with enormous metropolitan population centers sitting either inside, or right outside the caldera. -Both calderas have a big risk for even mid-sized eruptions due to population proximity. -Both calderas have had multiple enormous eruptions in their past history. Actually, I think it really should be the other way around, since Amatitlan is a bit larger, has a larger subset of somma volcanoes, and the earthquake situation is a bit riskier. Reactivation of Agua volcano in my opinion would be worrying for the people of that region. Thanks, definitely looking forward to more. There is some intense glacier/hydro-thermal activity going on at Bardy. That was also pointed out in a comment at the previous post, http://www.volcanocafe.org/life-in-the-fast-lane-mount-st-helens/comment-page-1/#comment-8489 Glacial melt? If you look at the DJK drumplot which is just west of BB you can see what looks more like glacial melt, this shows on VON, DYN etc…. it comes and goes. The KISTA drumplot looks different, more like GRF with its hydrothermal activity. The activity has picked up at KISTA in the last few days, melting has been going on for weeks now. 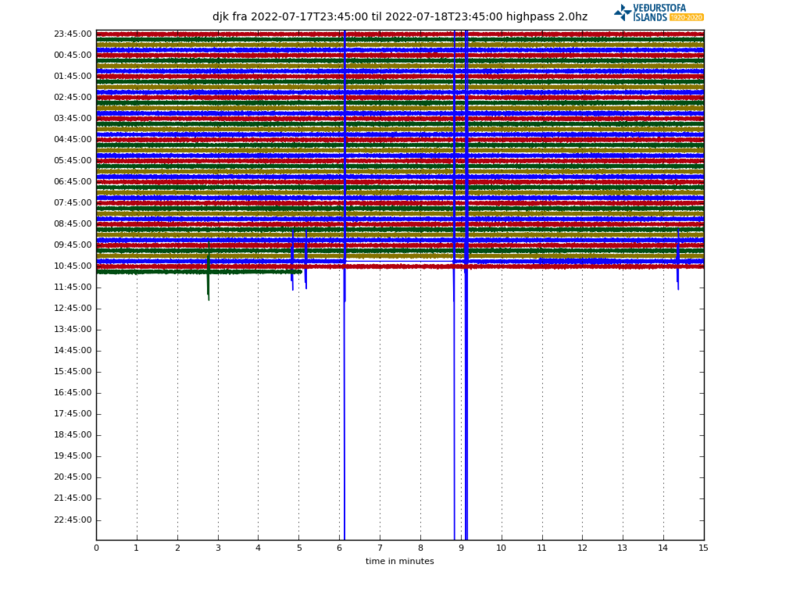 But, on the tremor plot it shows up on the KISTA plot just like all the plots surrounding BB? Also, the lowest frequency is also picking up, so I am still not entirely convinced that this is just melt or there is hydrothermal action as well, ……for what it’s worth. Great read Carl, but there is no way I could live with that feeling in the background and I tip my hat as a chocoholic that someone can. W/SW Vatnajokull really ramping up. Could you give some sort of interpretation of this? My gut feeling would be it’s water; maybe we’ll see a hlaup in a day or two. Along with this, almost all of the GPS stations around BB have trended downwards over the last few days. Another thing worth specifically mentioning is that Pacaya, despite being a smaller, frequently erupting, and growing stratovolcano is at specific risk for slope collapse. ~3 m of along-slope movement of the southwest sector of the edifice during these eruptions. Based on national census data from 2002 and population growth estimates from the World Bank (http://data.worldbank.org/data-catalog/population-projection-tables), a debris avalanche with a volume and direction similar to the previous collapse could affect more than 11,000 people (Fig. DR7). Evidence of a magma reservoir high in the cone (Eggers, 1983) suggests that a collapse event could cause rapid decompression of shallow magma, potentially affecting areas outside of the debris avalanche deposit zone. An interesting Katla graphic from IMO. Where do you find these graphics? I’ve been looking around on vedur and jardvis but I’m unable to locate them. Hope it is of interest to folks here! More ultra-shallow green stars at Katla. Shallow activity has been going on now for some months. would like to see comments on that from some of the experienced VC contributors. Is it just the recurrent summer quakes that Carl sorted them into some years ago or is this a new pattern? Why so shallow? No GPS or tremosr signs of something more dramatic right now. They are (so far) only the recurring summer quakes, imo had a short little notice up about them for a week or so, they will however keep an eye on the area incase something gets triggered. I’m off to Iceland in a few days for an 11 night ring round trip. We are going off the ring road up to Raufafhofn and in a few other places. Anywhere we shouldn’t miss, any advice on offer would be gratefully received! We have travelled around the south before a little bit and watching Katla’s current quaking I’m a little concerned about a glacial flood. I’ve also ruled out hiking Hekla as I feel the risk is too great (Don’t want to win GeoLurkings Darwin Award!). I really the north, especially around Akureyri and Eyjafjordur. If you do make it to Akureryi, be sure to check out the folk art museum. Asbyrgi is beautiful. Otherwise, Vestfjirdir and around Snaefellsnes. And Hotel Djupavik if they have rooms. If you can find an Upp I Sveit (in the country) guide at a tourist center, try staying at farms, though rooms may be limited at this time of year as its peak tourist season. I am envious. Don’t know the area myself so can’t give suggestions (apart from agreeing wit your choice not to for for the Hekla Darwin award – GL would call it home stulsus). Hekla is a dangerous beast. I like to show some observations made at the focal depth of earthquakes in the Bardarbunga area, what are your thoughts about these? http://hraun.vedur.is/ja/Bardarb/bb_lib_mag.html and used part of it to extract three episodes with different frequency and depth. What could be the reason of change? Episode August – December 2015. In de period januari – mid of June 2016, activity in the upper 5 km is ongoing quite regular, but beneath 5 km activity clearly was less compared to August – December 2015. After the first week of Juni there was another change. Above about 2,5 km activity is much less and in the area 5 – 10 km activity has increased again. Perhaps the shallow quakes are seasonally? The result of shifting weights of the icecap growing and later melting and the melting water moving around? Its just a wild guess though. The two large earthquakes in May and June changed the pattern. 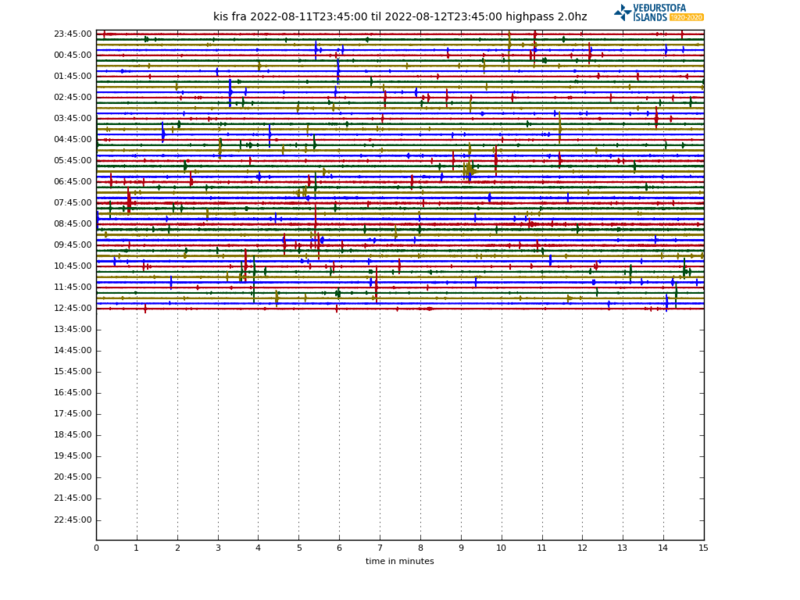 In both cases, earthquakes in the zone above them stopped for some time (~1 month). They removed a lot of the local stress, and it takes time for that to build up again. perhaps the re-inflation has also lessened or stopped? Isn’t that when they began using an improved method for calculating quake depths? Don’t know about the shifting weights…, the percentages would be minor I guess. Yes, I remember discussion/remark about adjustments made/improved measurements, scrolled the comments back to end of may (scroll scroolll, scroooolllll) 😉 , but couldn’t find it. Looking at GPS graphs by IMO, many stations have a rather strong glitch about november last year… might be a result of the those improvements? At the same time Grimsfjall, Stora station started to move southeast (again), and Hamarinn to the north. The lessened earthquake activity between 5 and 10 km depth seems to have taken place together with a pause in the uplift measured by the same stations mentioned above. Someone knows where the stations Rjupnabrekkuvisl (RJUC) and Stora (STKA) are? I couldn’t find them at the regular maps. Hello from Iceland, its been a while. Can any one tell me what kind of quake is this? it has a bit of run up to it. The HVO has reported that the lava flow 61g has crossed the costal plain and has started to empty into the ocean. Missed this by 6 days! Photo from our trip to The big Island, I hope! I forgot to mention that a new post was put up yesterday! The most unusual bathing place in Iceland, a natural pool to the north-east of the newly formed lava at Holuhraun in the 2014-15 eruption, has now disappeared….